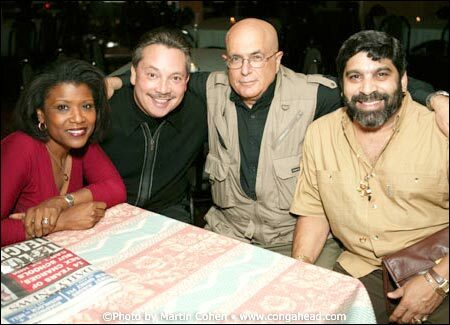 Vivianne Cohen, Eddie Montalvo, myself and Gilbert Colon, Jr. I had the honor of meeting salsa great, Eddie Montalvo, in 1977, and we have been close friends ever since. Eddie has worked with some of the most important names in Salsa music, and has participated on several of my recording projects, including the drum solo recordings, which feature many other outstanding drummers. It was my pleasure this year to be able to celebrate another of his birthdays, by attending a concert, led by keyboardist, Gilbert Colon, Jr., especially for Eddie.